Dr. Margaret McCarty, the first executive director of Christian Brothers Conference, has announced her resignation effective June 1, 2015, at the conclusion of four years of service. As executive director, McCarty serves in a leadership role in developing programs and services to advance and promote the Lasallian mission in the Region. She is a key representative of the Lasallian educational network to a variety of external organizations. McCarty has led Christian Brothers Conference to achieve many accomplishments, including continuing excellence in programs, enhancing communications, stabilizing and expanding fundraising efforts, and implementing the Lasallian Education brand throughout the Region. 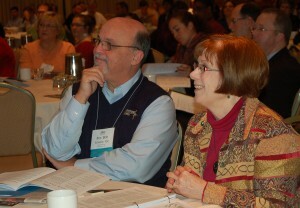 Then-General Councilor Brother Robert Schieler, FSC, and McCarty enjoy a session at the Huether Lasallian Conference in 2012. In 2011, the Regional Conference of Christian Brothers (RCCB) established the role of executive director and the Lasallian Education Council in response to a call from the Institute of the Brothers of the Christian Schools for Brothers and Partners to share responsibility for the Lasallian mission. The Lasallian Region of North America (RELAN) was the first Region to develop this innovative structure of shared leadership. 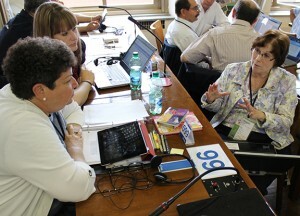 At the International Mission Assembly in 2013, McCarty speaks with fellow RELAN delegates Janet Ruggiero and Heather Ruple. McCarty completed the Buttimer Institute of Lasallian Studies in 2013. She also attended and served on the planning committee for the Region’s first Lasallian Research Symposium in 2012 and the Lasallian Women’s Symposium in 2013. Additionally, McCarty served as a delegate to the International Mission Assembly in 2013 and a member of the International Council for Lasallian Educational Mission (MEL). 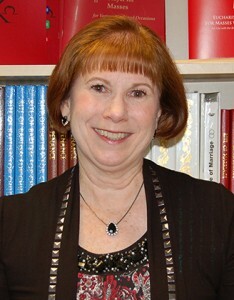 Over the next five months, McCarty will continue her role of accompanying Conference staff and Regional programming, representing Lasallian education externally, collaborating with the General Councilor in implementing the propositions of the 45th General Chapter, and focusing on implementing priority initiatives as identified by the Council.